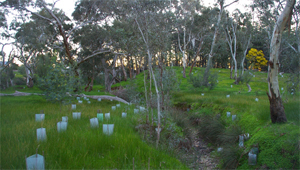 Winter 2010: Laughing Kookaburra, Galah, Superb Fairy-wren, Blackbird*, Red Wattlebird, Silvereye, White-naped Honeyeater, Yellow-faced Honeyeater, White-plumed Honeyeater, Brown Thornbill. Autumn 2010: Laughing Kookaburra, Superb Fairy-wren, Australian Magpie, White-plumed Honeyeater, New Holland Honeyeater, Crimson Rosella, Red-browed Firetail, Galah, Weebill, Grey Fantail, Red Wattlebird, Brown Thornbill. Summer 2009/10: Laughing Kookaburra, Superb Fairy-wren, Australian Magpie, Brown Goshawk [pair on 20/12], Yellow-faced Honeyeater, New Holland Honeyeater, Long-billed Corella, Crimson Rosella, Brown-headed Honeyeater, Weebill, Red Wattlebird, Purple-crowned Lorikeet, Galah. Spring 2009: Red-browed firetail [nesting], Crimson Rosella [feeding young in nest box], Laughing Kookaburra, Willy Wagtail, Brown Goshawk, Red Wattlebird, Yellow-faced Honeyeater, Silvereye, Eastern Rosella, White-plumed Honeyeater, New Holland Honeyeater, Galah. 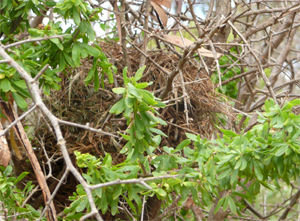 Red-browed Firetail nest in Boxthorn, Rotunda Park.